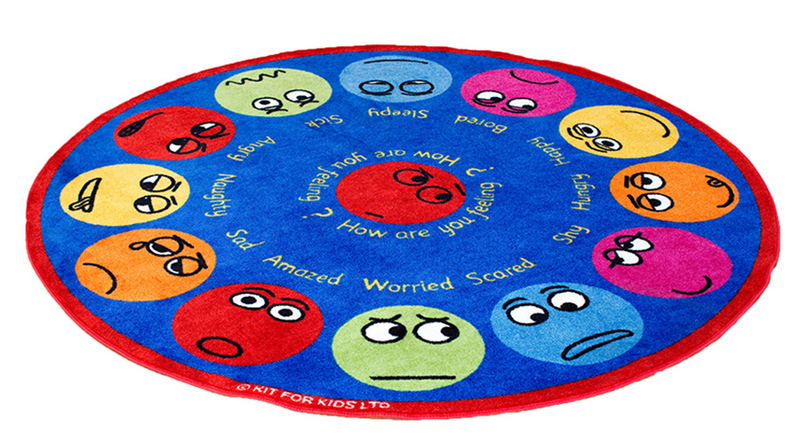 Our Emotions Interactive classroom rugs are highly visual colourful carpets with 12 different emotions, feelings and keywords to encourage group discussions. Each emotion acts as a placement seat for children to sit on during group learning activities, and can also be used as a part of a fun interactive game. Designed for use in schools, pre-schools and nurseries, these classroom carpets are available in 3 shapes - rectangle, square and circular. Manufactured with comfort and longevity in mind, each carpet is made using an extra thick tuf-pile Nylon material which is hard wearing but soft textured. The tightly bound edges prevent fraying and the tuft strands meet heavy duty laboratory pull tests for a longer lasting classroom rug. Ideal for early years’ classrooms our educational rugs feature a specially designed anti-slip Rhombus backing to ensure safe use on all surfaces, and meets essential safety standards EN71 Parts 1, 2 and 3. Easy to maintain, they can be spot cleaned with a damp cloth and the anti-crease feature means you can roll up the mat and store it when not in use.